The Suffolk Megafinal took place at Woodbridge School last Sunday. This event is the second of four levels where children try to reach the final of the UK Chess Challenge - the Terafinal. A total of 62 children entered, mainly from schools and clubs around the county (a few Essex and Cambridgeshire children entered too). Only those who performed well at the first stage of the competition qualified for the Megafinal. 13 of these qualifiers were from the Bury Knights Junior Chess Club, whilst other qualifiers came from the Ipswich Junior Chess Club, Martlesham Heath Junior Chess Club, Woodbridge School, the Royal Hospital School (Holbrook), Orwell Park School, St Albans High (Ipswich) and several other chess-playing primary schools, at Bosmere (Needham Market), Handford Hall (Ipswich), East Bergholt, Bealings and Birchwood (Martlesham)..
Perhaps the outstanding individual result was the maximum six points out of six, scored by six-year old Indula Dedigama (Bury Knights). Indula has only recently had his sixth birthday and was competing in a section for Under 7s and Under 8s, so some of his opponents were two years older than him. Two other players scored maximum points - Rowan Kent (Woodbridge School and Bury Knights) in the Under 9s and Adam John (Bury Knights) in the Under 12s. The full results will be posted soon on the UK Chess Challenge website (scroll down to 'Suffolk'). Suffolk's County teams (First team and Under 160s) played their National quarter-final matches over the weekend. The First team beat Warwickshire 8½ - 7½ (but see below), however the Under 160s crashed out to Essex by 6 points to 10. The First team played their match at a 'halfway' venue, in Bedford. In the Minor Counties section each team is required to have an average grade not exceeding 180 and Suffolk managed to compensate top board Alan Merry (240) by playing James Pack (132) on Board 16. Ironically, Alan lost, whilst James won! Warwickshire fielded an ungraded player for whom permission had not been given by the Controller. This entailed a default grade of 180 to be allocated for that player, which pushed Warwickshire over the 180 average limit (181.25). Two penalty points were therefore deducted from the Warwickshire total, making the final result 8½ - 5½. Other Suffolk wins were recorded by Graham Moore, Ed Player. Ted Matthewson and John Feavyour. The Under 160s played their match against Essex in Ipswich, at the Labour Club in Silent Street. Although the room was a little cramped, it was free of charge, a gesture from the Club which was greatly appreciated. With ten games completed the match was level at 5 - 5. But the remaining six boards could only muster two draws between them. Steve Lovell on Board 7 managed a great win in just 14 moves, but the only other Suffolk winner was Board 2 Jaden Jermy. My (Bob Jones) own game finished in a draw, but I should have won. What would you have played as White in the following position? The correct move is axb5, but I played cxb5, wanting to get my pawns further away from my opponent's king. Wrong idea! After axb5, the c-pawn is a passed pawn and the Black king must remain in attendance. 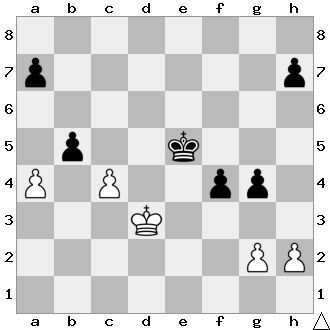 White can then mop up Black's remaining king-side pawns.